Is anyone gunna tell Gina how to take a screenshot? Umm…her niece/nephew took this photo not Gina. I think I’ll leave this thread now..I’ve embarrassed myself enough. I hope her aunt has roadrunner in her blood. 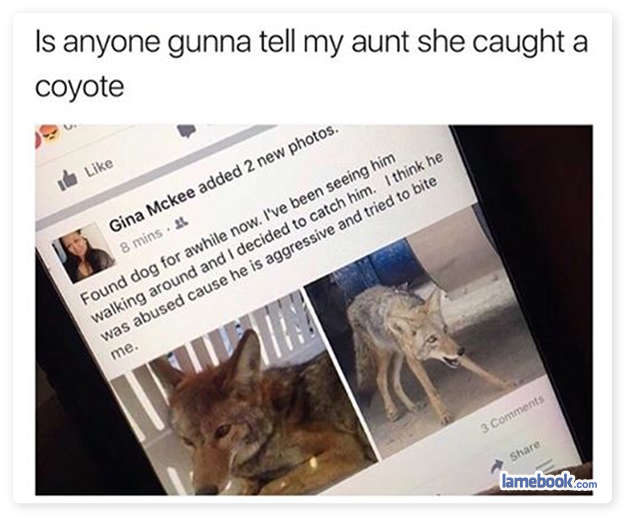 Ah yes, this was the story about Gina Mckee showing off her Photoshop skills – she didn’t really haver a coyote n her house – and everybody fell for it. Including her husband who was at work reading her Facebook updates. So yes, very funny.